Paracord - is nylon cord which was initially used by the American air forces. Thanks to its simplicity and multifunctionality it conquered the market of tourists and enthusiasts. Nowadays Paracord is an indispensable thing in daily life, camping or hiking. It is widely used in the manufacturing of clothes, bags, strings,bages, vests, functional and original accessories. Thanks to its multifunctionality and reliability paracord can be used on a daily basis, in tourism, and for military needs. There are several main types of paracord: paracord 750, paracord 550, paracord 100 (minicord), and microcord. The last two assumes huge esthetic and practical meaning. They are popular in many spheres of life, but their main purpose is being a nice ornament for a wristband. A special feature you need to know about is the material our string made of. 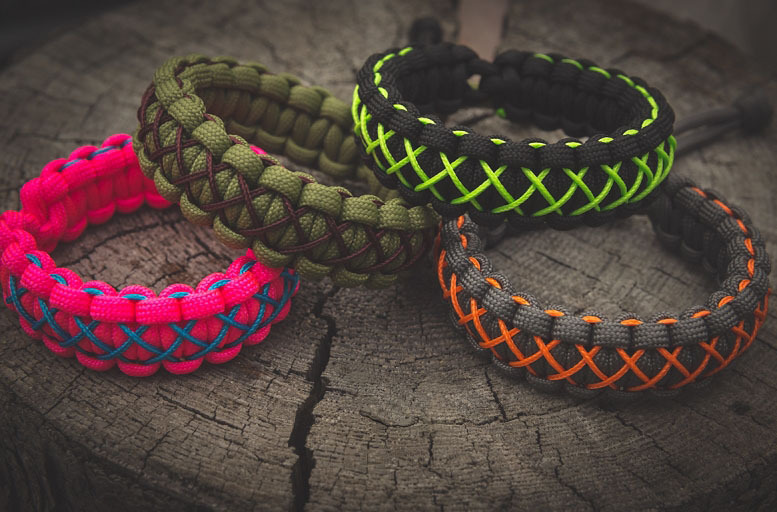 Original American paracord consists of 100% nylon. Chinese analogs are less reliable and durable. Our company provides original high-quality American paracord for the markets of Ukraine and Europe. Our products are affirmed by the international certificate of quality (ISO 9001) and C.D.C certificate which is really needed if you are up to tender or export. - Ukraine is closer to EU than the USA or China so we are able to respond your orders much more quickly. - shipping is cheaper and quicker. - picture samples of our products can be sent to you if needed. - if your website is capable of hosting a high number of data on it, we can fill up the information for you. All you need is to load the file on the sites database. - we offer OEM options, thus you can push your own brand on the EU market. - we also provide different equipment that could be of interest to your target audience. Those are: survival bracelets, lanyards, safety cords for guns, knives, flashlights, etc. OEM option is available for these products as well. Thanks to the international experience and pleasant environment, we work with textile industry, building companies, military and touristic stores, travelers and hikers. FIBEX is widely known out of Ukraine and our manufacture power allows us to produce large orders for a short time. 1. Оплата наличными при получении заказа в офисе компании «Новая Почта», для жителей других городов (оплачивается комиссия за пересылку денег - 13 грн. +2% от суммы заказа)*. * - при заказе от 1000 метров паракорда обязательна предоплата 100 грн. При заказе товара до 14:00, мы отправляем его в тот же день. На следующий день, в большинстве случаев, Вы его сможете забрать у себя в отделении Новой Почты. 1. Службой доставки «Новая Почта» по Украине. 2. Самовывоз в Харькове (г. Харьков: ул. Серповая, 4, оф. 716, от станции метро "Научная" 250 метров). Служба доставки «Новая почта» доставляет грузы в большенство населенных пунктов Украины. к пункту выдачи «НП» с полной предварительной оплатой за товар — от 30 грн. к пункту выдачи «НП» с оплатой при получении — от 30 грн. + (13 грн. + 2% от стоимости посылки) за наложенный платеж. до «дверей» в Вашем городе — 49 грн. Пункт выдачи находится по адресу: г. Харьков, ул. Серповая 4, 4 эт., офис 716 (м. Научная). 101 way to use paracord. Multifunctional cord. Nylon vs Polyester Cord. Which one is Better? Our company specializes in the production of nylon paracord 550 (type III) of the classic American technology.This type of paracord is different ease, flexibility, strength, and can withstand up to 250 kg load on the break.